Machine Quilting and Wholecloth are both now completed for this year. 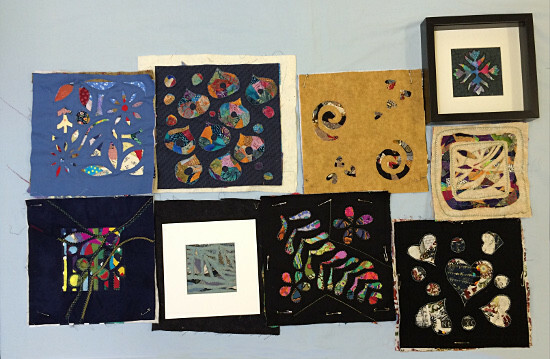 Last Sunday’s workshop was Reverse Applique, a system which changes the way of thinking about applique. 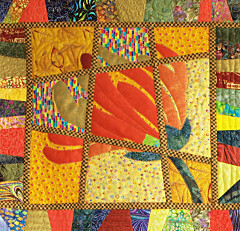 Usually, applique implies pieces of fabric added to the surface of a quilt. In Reverse Applique, there is an extra layer. In this workshop, we used lots of ‘scraps’ of fabric. The top layer is then placed and secured to complete the ‘sandwich, then stitched down in a pattern. Sections are cut away to reveal areas of the ‘scrappy’ layer beneath. It’s fun to do because you are never sure what will be revealed in the cut-away, and you can play around with colours in the ‘scrappy layer’ to enhance the effect. Once all the design is cut away from the top layer, it’s time to enhance the piece with hand and machine stitching, and the addition of couching and beading. It’s a busy workshop with lots to teach and great results. This technique can produce stunning images. Everyone left the workshop buzzing with ideas. Keep eye on my workshops and courses page for future workshops at llandygai. I’m a tired but happy teacher! This entry was posted in Blog on 17 May, 2016 by admin.